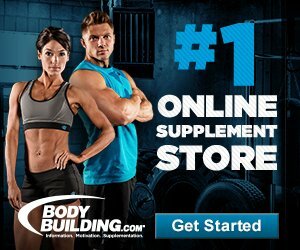 Comprehensive review of BioTRUST Low Carb. See what real experts and actual users have to say about this protein powder. At 3.5 out of 5 stars, BioTRUST Low Carb protein powder has some good qualities to it but fell short in other areas. I’ll start off with what I like about it. It has pretty solid macros, including 24 grams of fast and slow absorbing protein: Micellar casein, Whey Protein Isolate, Milk Protein Concentrate, and Whey Protein Concentrate. The proteins are hormone (rBGH/rBST) free and processed at low temperatures to keep the quality and bioavailability intact. It’s very clean and perfect for low carb dieters or those trying to lose or maintain weight. There’s no artificial colors, flavors, sweeteners, GMOs, gluten, or soy. It has 4 grams of fiber per serving and I definitely noticed that I stayed full for longer. I wasn’t starving at the gym and had a little more energy. I didn’t have any negative side effects or belly bloating, which is a huge plus. It also has an amazing 1-year 100% satisfaction guarantee. Switching over to what I don’t like about this protein powder. One of my biggest issues is the insanely expensive price tag. Once you factor in shipping, it’s just under $60 for a measly 14 servings. I don’t think I’ve tried a protein powder this expensive. It uses some quality ingredients and is a good product but nowhere near $60 worth. That was a main reason I couldn’t rate this protein powder any higher. It also doesn’t taste that great with its incredibly bland, overly thick, chalky tasting formula. One last thing is that it doesn’t list the exact digestive enzymes used in the blend, which is a bit frustrating. Overall, this protein powder is a bit better than average. This powder is easy to use. It mixed up in a shaker cup within 15-20 seconds. There’s no need for a blender, which makes it convenient. Just take 2 scoops and mix it with 8 ounces of water or milk. A word of caution is that it ends up being pretty thick. I got this protein powder in the Strawberry Banana flavor. It has a subtle sweetness to it but it’s mostly bland. There’s a slight bitter aftertaste and it’s very chalky. For the macros, it has 24 grams of protein, 2.5 grams of fat, and 8 grams of carbs for every 2 scoops (1 serving). It has 4 grams of fiber, so that brings the net carbs down to 4g. Each serving has 150 calories. These macros are good for sustained energy, weight loss, and building and repairing lean muscle. This protein powder uses a time-released four-protein blend. Each of the 4 protein sources makes up 25% of the blend (4 equal parts). The protein sources are: Micellar casein, Whey Protein Isolate, Milk Protein Concentrate, and Whey Protein Concentrate. It uses a combination of fast and slow-acting proteins. For instance, micellar casein is very slow absorbing whereas whey protein is very fast absorbing in the body. This allows for a longer, steady rate of protein absorption. This protein also includes ProHydrolase®, a digestive enzyme blend, which aids in overall digestion and helps you absorb more protein. Unfortunately, they don’t include which digestive enzymes are included in this formula. This is definitely a bummer. BioTRUST Low Carb uses all hormone (rBGH/rBST) free proteins and is made is natural ingredients. There aren’t any artificial colors, sweeteners, or flavors. It uses stevia leaf extract as the sweetening agent. It’s non-GMO, soy free, and gluten free. I felt really good while taking BioTRUST Low Carb. I didn’t feel sluggish or get bloated after drinking it. I felt full for longer, which helped with my energy levels at the gym and throughout the day. It does contain milk, so be careful if you’re sensitive or allergic. After trying out this protein powder, we think it’s best for aiding in weight loss, sustaining energy, and building and repairing lean muscle. It has a combination of time-released proteins to help with muscle recovery and aid in overall performance. It’s also ideal if you’re following a low carb diet or eating clean. 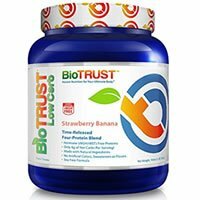 A 1.16 lb container of BioTRUST Low Carb costs $49.00 on the BioTRUST website. You also have to tack on another $9.95 for shipping. This works out to 14.58 cents per gram of protein (17.54 cents if you include shipping). This is one of the most expensive protein powders I’ve tried so far. You only get 14 servings per container, yet you’re paying $58.95 out the door. I honestly can’t believe how pricey this protein powder is. Even though it’s a higher quality than average, I don’t think the hefty price tag is worth it. BioTRUST has an amazing guarantee! If you aren’t 100% satisfied with your product, you can return it for a full refund. The biggest bonus is that you have an entire year to try out the product. I love that they offer such an awesome satisfaction guarantee. To buy BioTRUST Low Carb, click here.